I can’t help but cry when I think about the destruction I’ve witnessed in my native Indonesia. Where once there was a thick, green rainforest teeming with life, now is desolation. Where orangutans used to swing and birds used to sing, now is silent. Where people used to be able to depend on the forest for food and medicine to live, now there is nothing. Our precious rainforests are being destroyed to make way for palm oil plantations, endangering species and exploiting our people. 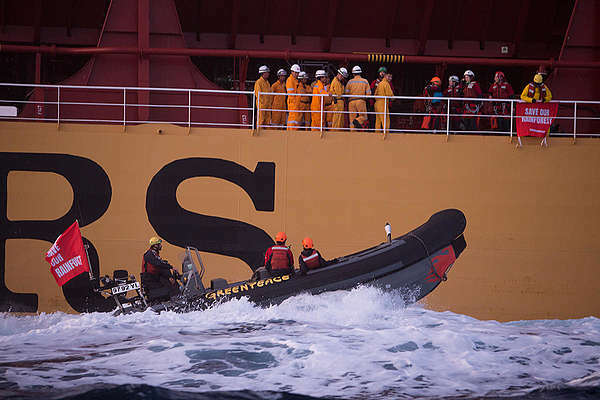 Crew members of the Stolt Tenacity tanker ship confront six Greenpeace volunteers who boarded the giant tanker ship carrying dirty palm oil from Indonesia to Europe in a peaceful protest against rainforest destruction. That’s why I’m here. 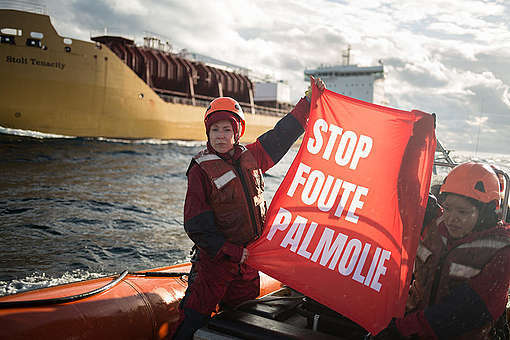 Right now, me and five other activists are on board a massive shipment of dirty palm oil in the Atlantic Ocean, which is likely headed for products on European supermarket shelves. Wilmar, who owns this shipment, is the largest and dirtiest palm oil trader in the world. This is risky, and scaling the side of the ship was tough, but not taking action is riskier for our planet. And I can’t be quiet anymore. People in Indonesia are sick and tired. We are still recovering from the brutal 2015 fires that choked thousands of people in our cities and displaced communities in our forests. Wilmar has been turning its back on deforestation and human rights abuses for too long. This ship is bringing palm oil from forest destruction into people’s homes. We have lost so much rainforest already, but this is our chance to stop the next bulldozers before they get started. Much loved household brands like Oreo, promised their customers they’d only use clean palm oil. But they haven’t kept that promise. 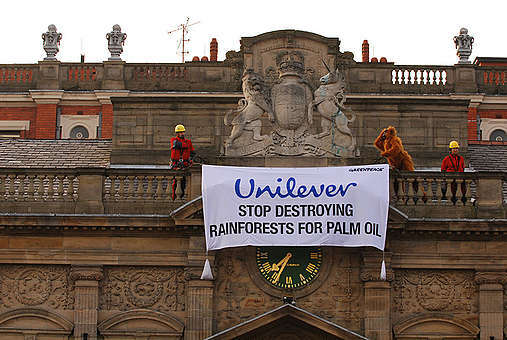 Brands that buy dirty palm oil from Wilmar are not only contributing to an environmental and social disaster, they’re also failing their customers. Palm oil can be produced without destroying rainforests and we won’t settle for anything less. I am taking action because companies who promised to fix the problem are not. By being on this ship, I’m making sure that Wilmar can’t ignore our call to clean up their act. I don’t want to look back at the destruction and feel like I didn’t do anything about it. We have to stop them now. Otherwise, this destruction will continue and spread to other parts of the world. And that is not a world that I want.